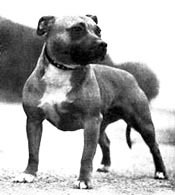 Staffordshire Bull Terrier - Stafford Mall Directory. Online depository for past, present and future Stafford history. The place to discover current happenings with Stoutheart Staffords, our breeding program, and just rambling Stafford thoughts. Staffords, Pit Bulls, and just general news stories about dogs and other important links. Updated weekly if not almost everyday. Is a Stafford the right dog for you? We need your Stafford Heroes story. Take a look and have Kleenex ready.